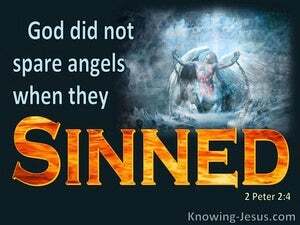 For God did not [even] spare angels that sinned, but cast them into hell, delivering them to be kept there in pits of gloom till the judgment and their doom. For if God did not spare sinning angels, but thrust them down into Tartarus, and delivered them into chains of darkness, being reserved to judgment. 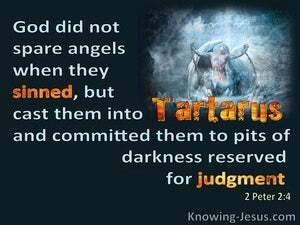 Remember, God did not spare angels when they sinned, but sent them down to Tartarus, and committed them to caverns of darkness, to be kept under guard for judgment. For God did not spare angels when they had sinned, but hurling them down to Tartarus consigned them to caves of darkness, keeping them in readiness for judgement. 'He puts no trust even in His servants; And against His angels He charges error. "For the wicked is reserved for the day of calamity; They will be led forth at the day of fury. 'So as I live,' declares the Lord GOD, 'surely, because you have defiled My sanctuary with all your detestable idols and with all your abominations, therefore I will also withdraw, and My eye will have no pity and I will not spare. 'My eye will show no pity nor will I spare. I will repay you according to your ways, while your abominations are in your midst; then you will know that I, the LORD, do the smiting.